Since long natural resources and their extraction have made their contributions to and impact on the organization of society, establishment of global connections and the framing of individual lifeworlds. In the Ashanti Kingdom, for example, the extraction of gold contributed to the establishment of its socio-political system and, combined with salt extracted in Northern Africa, the development of a vast network of trading routes across the Sahara. With the discovery of diamonds in Kimberley (South Africa) in 1866, this quiet place turned into a hot-spot, attracting numerous men and women from all over the world, becoming the stage where dreams were found and hardships faced. Similar scenes unfolded in the USA and Australia with the emergence of so-called ´gold-fevers´. In Germany, the extraction of coal in the 19th century, especially in the Ruhr Valley and Saarland, generated national wealth, local job opportunities and positioned Germany in a growing global energy chain, while the closure of many coal mines in the second half of the 20th century posed, and still poses new environmental and social challenges. Likewise, Cornwall´s (UK) tin mining heritage sites, such as the Geevor Tin Mine and the East Pool Mine, remind us of bygone days in which local young men earned a living in the mines and how Cornish ´mining culture shaped your world´, as Cornish mining techniques, knowledge and (wo)manpower was exported all over the world. An impressive amount of energy, labour and capital has thus been and still is invested in the extraction of natural resources. In 1999, for example, the International Labour Organization estimated that approximately 80-100 million people worldwide depend on artisanal mining for their livelihoods. To this number, the amount of people working for large-scale and industrial mining and oil & gas companies should be added. Moreover, besides dedicating one´s labour power to the extraction or processing of natural resources, people also appropriate resources in different realms, such as in religious, political or private and intimate spheres. These are just but a few examples and many more could be added, yet, all these examples show the effects of resource extraction in society and the ways in which this extraction established global connections through trade, migration, production and consumption, as well as debates on climate change, use of fossil fuels and sustainable mining. In other words, resource environments and resources in themselves become nodal points of global connections and local lifeworlds. Taking a closer look at the following picture of two diamonds lying in the hands of a Sierra Leonean miner can explain this further. These diamonds were found in the mining areas surrounding Koidu, the main town of Kono district in the Eastern Province of Sierra Leone. Many of these areas contain long-abandoned waste material of former mining companies. However, this waste still contains diamonds. For the digger finding these diamonds may have been a source of income, perhaps survival. He – in Sierra Leone most diamond diggers are men – may have made some offerings as diamonds are part of religious imaginations, and protected himself from bloodsucking leeches by applying old motor oil to his legs when working in the water. It is likely he worked together with friends or relatives and paid some (symbolic) amount of money to the landowners or chiefdom authorities in order to be able to mine in peace and quietness. From the sieve of the digger these diamonds made their way to the man holding them in his hand, who may have got it from another middle-men himself. The diamonds are now (2009) offered to a Korean diamond dealer, although it could have been a Lebanese, Israeli or Sierra Leonean dealer as well. Usually the estimated monetary value of the diamond influences where it´s being offered: the more expensive diamond quickly finding their way to financially strong dealers. 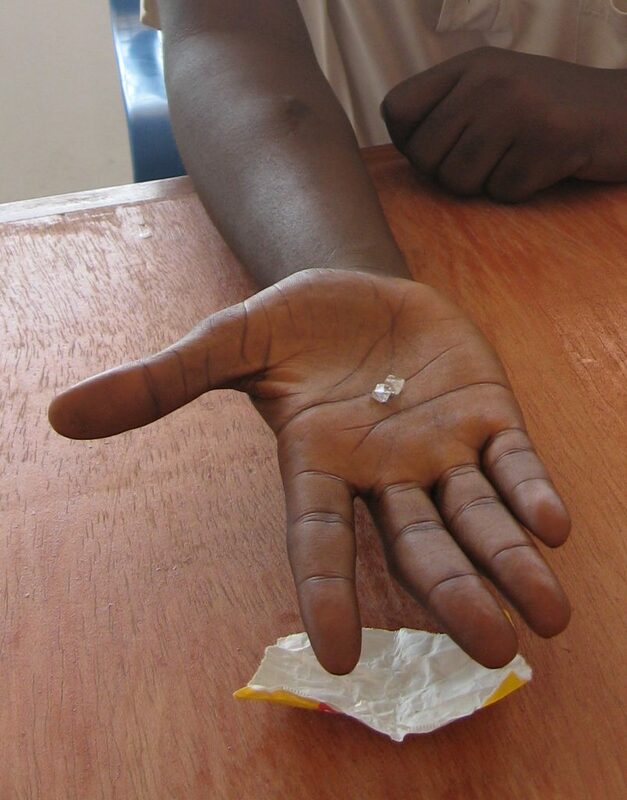 If the dealer decides to buy these diamonds they will enter the international market, but not before they have been certified as conflict-free diamonds and the government of Sierra Leone has registered its existence. However, the stone could have ended up in the hands of people who use its proceedings to engage in criminal activities as well, turning the diamond into a ´blood diamond´ in the most extreme case. After registration they will be exported and further traded in perhaps Tel Aviv, Antwerp or New York or in the Bharat Diamond Bourse in Mumbai, a diamond center established in 2010 which now has ´over 4,000 members engaged in import and export, manufacturing and marketing of rough and polished diamonds´. Perhaps they end up under control of De Beers, a diamond conglomerate with its origins in the South African Kimberly mines. Considering that these diamonds are of a relative good quality (the four C´s rule applies), they will be cut and polished, and transformed into a piece of jewelry decorating a golden engagement ring or silver necklace. When transformed into jewelry they may become the tangible examples of famous slogans such as ´Diamonds are a girls best friend´ or ´A diamond is forever´, exemplifying love and romance, rather than sweat and hard work. Had they been of a lower quality, they may have ended up in diamond drill bits, later being used by a mining company to ´open up´ the earth in order to find new precious minerals or other resources. Clearly, in all these phases and situations diamonds are dedicated different values and meanings. Inserting these different values, meanings and ´connections´ into the picture, these stones start to represent something more than heated and compressed carbon. As the picture illustrates, these stones are embedded in numerous social, economic and political practices, discourse and imaginations. 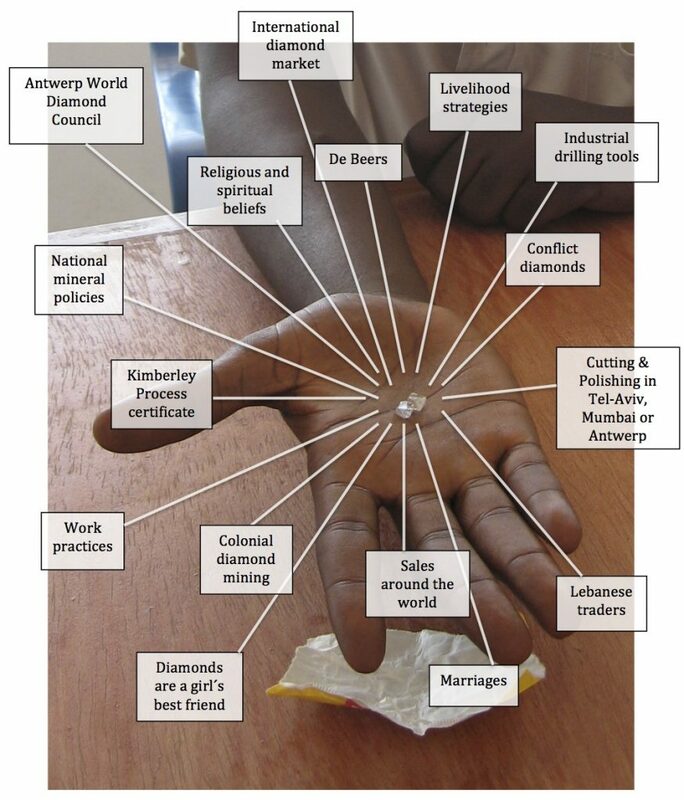 Through the movement of the stone in the global value chain, these meanings may change or become more or less prominent depending on the particular situation. However, the stones themselves carry these meanings and practices at every stage of the chain, thereby linking people and places to each other in sometimes surprising, confronting and/or stimulating ways. Consequently, studying diamonds, or any other natural resource, may open possibilities to study the global connections of resource extraction, showing how meanings and practices ´travel´ and change, and how resources tie us all together.